Beulah Mae McCormick obituary. Carnes Funeral Home. 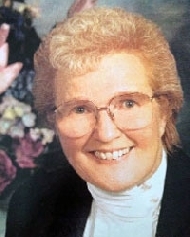 Beulah “Boots” O’Donnell McCormick was born in Hendersonville, PA on February 8, 1933 and entered Heavens Gates on August 28, 2013, at the age of 80. She was born to Daniel Byrd O’Donnell (deceased) and Hazel Triner O’Donnell of Waynesburg, PA.
Boots had an unwavering faith in our Lord, Jesus Christ. She attended Soul’s Harbor Lighthouse, Central Assembly of God and Lakewood Church. She also was active in The Beam of Hope Radio Program. Boots was a resident of Washington County PA, for the majority of her life, later moved to Houston, TX. She was a Cecil High School Graduate. Boots was predeceased by her husband of 37 years, Arthur H. McCormick of Canonsburg, PA in 1992. She is survived by daughters, Eileen McCormick Walker, Colleen McCormick Lambert and Maureen McCormick Bogard, all residing in Tx. ; Granddaughters, Brooke Ferguson, Erin Lambert, Jordan McCormick and Kirstie Lambert. Boots will also be missed by sisters, Mary Lou O'Donnell of Bethel Park, Faith Chaudry of Washington and Esther June Kratt-deceased. Brothers David O'Donnell of Waynesburg, Donald O'Donnell of Canonsburg, and Larry O'Donnell-deceased. In lieu of flowers, we ask for donations to be made for the research of Lewy Body Dementia. Baylor College of Medicine/Alzheimer’s Disease and Memory Disorders Center 1977 Butler Blvd St E5 101 Houston, TX 77030 713-798-4734. A secure, online credit card payment may also be made at http://www.bcm.edu/advancement/index.cfm?pmid=16150 .